Testing. 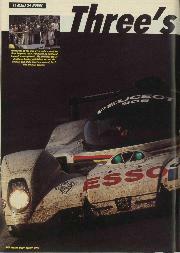 There had been a lot of that, four or five endurance trials each for Peugeot and Toyota in recent months. The 905s and TS010s have this year covered a greater distance at the Paul Ricard circuit than in the entire 1992 season, and fans of long-distance racing looked forward to the Le Mans 24 Hours with keen anticipation. Sadly, their hopes of a photo-finish were not fulfilled as Toyota threw it all away, "flunked it" to use a popular expression. 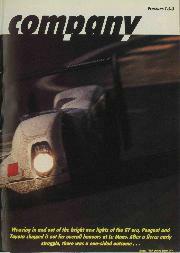 The classic 24-hour race was a pushover for Peugeot, satisfying the home crowd with a brilliant 1-2-3 success led by Geoff Brabham with rookies Eric Helary and Christophe Bouchut, but a let-down for those who went to see a France vs Japan arm-wrestling contest that would last around the clock. All three Toyota TS010s suffered from transmission failures similar to those which hit the team last year. The suspect parts were redesigned and coped easily with the 24-hour tests at Paul Ricard, but when it came to the race, they failed again.